29 Where do we go from here? Pam Tau Lee is a San Francisco activist. She is married to Ben Lee. Born in 1948 in Northern California, Pam Tau Lee was educated at Cal State Hayward and at Berkeley, where she was active in the Third World Liberation Front. At Berkeley she met the young Jean Quan. Okay, so this woman goes up there and does a presentation. That s where everybody else s eyes glazed over, but I was very interested. Here was somebody that sort of looked like me, and she was up there talking. She wasn't dressed fancy like these other people. Not that we weren't dressed nice, but they were, like, you know, very good clothes. So her name was Jean Quan. She is currently on the school board in Oakland. But Jean was a student. She was talking about what was happening here at Berkeley and she said, "You know, I dont know who here came from Chinatown, from the community." She'd always say "the community." And I came from the community, I mean, early so I was listening. She was talking about Chinatown. She said, "What we re doing is we re creating a movement to go back to Chinatown to help our people." And that all resonated with me. It didn t resonate with the other folks, but it really resonated with me! You know, "Our people are working in garment factories; our people are getting sick; our people dont have decent wages; our people, you know, are experiencing racism." Oh, the "R" word, that was a word that just sent chills up my spine. Oh, that s awful. Oh, I dont like that word. That was scary. That word was totally scary to me. But the other things that she said resonated with me: she said, "So, I d like people to think about coming to the community and volunteering." She passed around a list, so I signed my name and this other guy sitting next to me signed his name, and about a week and a half later we got a call-I got a call: "We need your help. Come to San Francisco." "We want you to answer phones. Just answer phones and help us do that." "Oh, okay." And so you know, I said, "Well, Fll be there next Thursday." I went up there, and I was walking down the street, just kind of, you know, here I m in college and I'm independent and my parents don't know I m here. I'm here in the same city as them, and I didn't call them. I didnt tell them. I m here on my own. I'm doing something and I didnt ask anybody for permission. And I go in there. It was to answer phones for a group called the Asian Legal Services. That was at one table. So I was at the Asian Legal Service table. It looked just like this, like this table-metal table. And that s because the metal table came from UC Berkeley! That's because the Department of Ethnic Studies paid for the table, paid for the chairs, paid for the phones, because that was this big fight, you know, to have people go to the community and the university should offer that kind of education so that people can help their people, and we can learn about our history and stuff. Then across the way was Draft Help, another organization. That was during the war, so people were coming down and getting assistance regarding the military draft legal assistance regarding the draft, understanding their rights. And if they didn't want to join the army, they didn't want to be drafted, how they could apply for conscientious objector. Then there was in the back room a group called the Red Guards. They were back there having a meeting. I just knew that they were back there-didn't know what they looked like, nothing like that, because I was just told: "So-and-so, they want the Red Guard, they're busy, so take a message." Ethnic Studies and Asian Studies was mainly student-driven, so the faculty was all students. The classes were all taught by students: people like Tsiwen Law, and Brian Fong, Carolyn Wong, Richard Aoki. Then for this to be able to survive, they had to start to look for professors, and thats when people like Ron Takaki and folks came on. Ling-chi Wang. But there was a big struggle because Ling-chi, who is my friend now but at that time we were on opposite sides, because at that time the professors, they wanted to be able to-they re thinking of their career, they're thinking of being able to have Ethnic Studies institutionalized within the university lean more towards the history. Pam Tau Lee was the sponsor of a Bay Area group. They called themselves the Bay Area Asian Students. They were made up of high school students from all over the Bay Area that had formed a coalition, and I helped to charter that. They did a lot of events and these activities had tremendous influence. In fact, today many of these students are still very involved in making social change. But I wanted to experience more. So I decided that I was going to not teach, and I left teaching. In the early 1970s there was work being organized by the U.S.-China Friendship Association to understand more about China. It was a people-to-people friendship to learn and build associations with what was going on in China-to learn about the revolutionary struggle there, also to learn how people were trying to make socialism back in the seventies-sixties and seventies-and how there could be another way that society could be structured. So that was one arena that I was drawn to learning more about alternative models for how a society could be structured-and I was starting to do more about that. Our organization was called the I Wor Kuen. That is the name of a group of Chinese in China who stood up against the imperialists-the white imperialists. They lost, but they were a hardy band of revolutionaries, And so we took their name, I Wor Kuen. We were going to become a part of the US revolution and our role would be to help link up what was going on in our communities with the overall picture. Then in 73, I helped open an organization called the Chinese Progressive Association, which I would ten years later be the chairperson of for many, many years. But our organization, the I Wor Kuen [IWK], was like the seeds of the opening of this mass organization. It took over a year. IWK issued a call in the community. Much of this happened before I really, really became involved, but this helped shape my thinking and my involvement. They issued a call and called for people to come together to form an organization that would have immigrants and non immigrants, older people, working-age people, and young people, men and women. And weekly, people would come and talk about what this organization needs to do, how would it address conditions of women who were what we would call triple oppressed: class, women, and race, ethnic. The young people were being beaten by the police-and brutality, and not having a voice. So all of this took a year. There were bylaws; there was voting on the bylaws. People got practice talking at meetings. When women stood up to speak, the men, by the end of the year, learned to listen to the women and not make, you know, snide remarks, not always criticize or correct them. Women were able to stand up and speak with more confidence and not hide and giggle, or not shy behind somebody else and say they had no opinions, because they did. And at the end of the year they had elected a steering committee and officers, a name, and they had bylaws. They had different kinds of group activities that they would do: serving meals on Sunday nights, showing movies on Saturday nights free to the community. There would be English classes, there would be a women s group, there would be a child care center. All of these things took a year. The funding for this all came from the people, and then people like myself who worked. And members of the I Wor Kuen I was also by that time- - would contribute quite a bit more to this organization. But events, dinners-we just scraped and managed to survive. And today that organization still exists. It s in Chinatown. I'm still a member. I was on the steering committee for the last several years. But they're doing great work in Chinatown. But I think about this a lot-this period of time, where by 75 we had done a lot of events around May Day and the working people's struggle, and thousands of people would come. We would put on plays about working people and people would cheer and find so much pride in being working people and seeing themselves reflected on the stage. It was wonderful. Pam Tau Lee was a member of the League of Revolutionary Struggle. He shared stories of how Alex Hing, Ben Lee, Gordon Chang and Wilma Chan and the community formed the Defend Daih Wong Support Committee. Daih Wong was beaten up by the police because he did not have a license to sell newspapers. It just so happened that the newspapers he sold were the progressive ones and also literature from China. The Harry Wong Support Committee protested police brutality and the right wing in Chinatown. We picketed in front of the police station and packed the court room. He spent a few days in jail and charges against Harry were dropped after court hearings. Community outrage to what happened to him, the victory when the people stepped up to unite and dare to confront the power, was one of the many events that lead to the formation of the Chinese Progressive Association. Yes, we held down the progressive pole in Chinatown and Harry says he is proud as hell we still do. 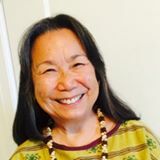 The Southwest Network for Environmental and Economic Justice, based in Albuquerque, works very closely with Pam Tau Lee, since the mid 1990s. She also works closely with the Indigenous Environmental Network, a network of various tribal representatives and community groups from native lands all over the U.S. and in Canada. Also the the Southern Organizing Committee for Environmental and Economic Justice. Founding the Asian Pacific Environmental Network, 1993. Peggy Saika was the executive director of the Asian Law Caucus at that time. Now she's the former executive director of APEN, followed by Joselito Laudencia, our new E.D. But her role was tremendous. And there were other people, from campus actually, that were students, just graduated. Pamela Chiang, who was a student here at UC, and then Pam Tau Lee, Jack Chin, who was with the San Francisco Foundation. And Eric Saito, Martha Matsuoka, and Francis Calpotura. According to Pam Tau Lee, "we met for about two years and looked at the needs and what we would want to do, and worked with the San Francisco Foundation, which helped us develop the bylaws and those structures to get one of those C3-kind of tax status." And then we got the funding and hired Peggy Saika and a woman named Yin Ling Leung to be our first staff. Pam Tau Lee, 67, will be inducted into the Hall of Resistance at the Ancient Africa, Enslavement and Civil War Museum in Selma, Alabama, created in tribute to those who work against oppression in all parts of the Diaspora. Pam Tau Lee, 67, will be inducted into the Hall of Resistance at the Ancient Africa, Enslavement and Civil War Museum in Selma, Alabama, created in tribute to those who work against oppression in all parts of the Diaspora. Lee is the founder and chairperson of the Chinese Progressive Association (San Francisco), and the founder of the Asian Pacific Environmental Network. "In 1955 I transferred to a non-segregated elementary public school. Moving away from the poverty of San Francisco's Chinatown did not fully address the impact of white supremacy; but it was the civil rights and later the black power movements that opened the door for hundreds of thousands of people like me to dedicate our lives to fighting for needed change; change that can end poverty, white supremacy, patriarchy and wars of aggression, a change for a better America. In 1972 Pam Tau| was a "24 years old, wild, crazy Asian young person who would be forever transformed by the 1972 political and social dynamics of that moment. I was a student “regular” at the International Hotel, deep into the Asian anti-war movement, and joined the New Left. In 1972 I was organizing in Oakland Chinatown and was also a student organizer with the Bay Area Asian Student Union. The activities leading to the formation of CPA was a “Bay Area” happening. The Lo Wah Que of SF Chinatown and young Asian activists united to hammer out the purpose and work of a community mass organization. After months of meetings, CPA was officially founded on December 26, 1972." In the early 1970s Martha Cody was involved in the International Hotel campaign with Pam Tau Lee, Tsiwen Law, and Ray Hing. Pam Tau Lee, contributed an article to Unity Organizing Committee's Unity, October 14, 1991, on the recent Southwest Network for Environmental and Economic Justice conference in Albuquerque New Mexico. Speakers included Richard Moore of the SouthWest Organizing Project, Lupe Galvan Fuerza Unida, Dr. Cynthia Hamilton Los Angeles, Susanna Almanza, Esperanza Maya El Pueblo, Locille Charley, Patsy Oliver Friends United for Safe Environment..
Look what I found Richard Moore Louis Head Catherine Murphy Pam Tau Lee I was so lucky to share that moment with many of you Lanita Morris Robert Battles Majora Carter Katynja McCory Roberto Roibal — with Shirley Pate, Esperanza Luzbert and Richard Moore. At the United States Social Forum in Detroit , a forum was held "Presente! Left Movement Veterans Discuss the Path to Power and the Role of the Left in the US" June 24th from 3:00pm to 5:00pm at Cobo Hall. It was sponsored by the Freedom Road Socialist Organization/OSCL. Getting ready for Hyatt arrest action. — with Hai Chi Vu, Tiffany Ng and Phil Hutchings, Pam Tau Lee, July 22, 2011. Wednesday March 14 2012 Counterpulse 1310 Mission Street San Francisco Panel discussion "Reboot the Rainbow: Unusual Alliances, the 99% and Fighting to Win". In the 1960s the Black Panther Party for Self Defense joined with the Puerto Rican Young Lords and the poor White Young Patriots Organization in the Original Rainbow Coalition (pre-Jesse Jackson). The model of "organize your own but fight together" was an attempt to build broad unity in dispossessed communities while dealing with the realities of racialized capitalism head-on. Come join a discussion of this history and what its going to take to keep the 99% together for the long-haul. Panel discussion will include a slideshow of the art of the Rainbow Coalitions. On the panel: Pam Tau Lee (member of I Wor Kuen), Joe Navarro (Los Siete De La Raza Defense Committee), Killu Nyasha (Black Panther Party) and Amy Sonnie and James Tracy (co-authors of Hillbilly Nationalists, Urban Race Rebels and Black Power: Community Organizing in Radical Times). Eric Mar April 21, 2012. With Raymond Fong, Chris Jackson, Myrna Melgar, Gabriel Haaland, Michael Tong, David Campos, John Avalos, Amy Bacharach, Ken Wang, Conny Ford, Robynn Takayama, Jane Kim, John Rizzo, Chris Gembinski, Steve Ngo, Evan Brown, Pam Tau Lee, Jeff Adachi, Rafael Mandelman, Wendolyn Aragon, Nicole Derse, Hene Kelly, Alex T. Tom, Sasha Cuttler, Myron Lee, Richard Rothman, Shaw San Liu, Jen Kwart, Mike Alonso, Nick Pagoulatos, Leah Taylor Pimentel, Alex Walker, Viva Mogi, Yvonne Liu, Linshao Chin, Dan Nguyen-Tan, Wyatt Lim-Tepper and Kelly Welsh Dwyer. Powerful action today, workers united to fight for $15, just hours and a union! — with Pam Tau Lee, Mario de Mira, Kathe Burick, Josue Arguelles, Conny Ford, Feng Kung, Michael Lyon, Ramses Sin Fronteras and Shaw San Liu at Gap. After yesterday's book reading with friends, mentors & sources of inspiration Pam Tau Lee, Cornelius Moore & Tony Ryan at the Howard Zinn Book Fair #howardzinnSF — at City College of San Francisco Mission Campus. Pam Tau Lee is founding member of Caring Across Generations, a member of Asians 4 Black Lives, a dedicated global environmental justice activist, a member of LeftRoots, and a member of the It Takes Roots delegation who participated in the December 2015 UN Conference of the Parties global climate change talks in Paris, France. "Role of Asian American and Pacific Islander Movements"
We are LeftRoots members whose identities fall largely under Asian, Asian American, and Pacific Islander (AAPI) categories. We joined LeftRoots because we are excited to build a Left organization together with other cadre from the ground up and to develop strategy together. AAPI cadre showed a lot of interest in responding to We Believe That We Can Win (WBTWCW) as soon as it came out. The writers of this document wanted to uplift AAPI communities’ role in revolutionary strategy. In February 2018, a group of LeftRoots cadre and compas (Pam Tau Lee, Michael Liu, May Louie, Lydia Lowe, Don Misumi, and David Monkawa) wrote a paper that was used as a starting point for this one. 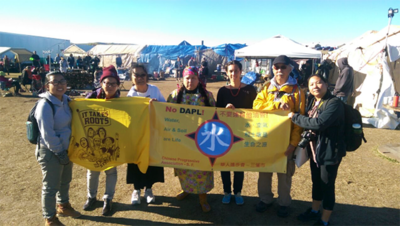 The week of September 26, 2016, Grassroots Global Justice Alliance members went on a "Berta Vive" Feminist Delegation to Standing Rock in solidarity with the #NoDAPL struggle to protect the water and land from a destructive pipeline project by the Dakota Access Pipeline. With on the ground leadership from Indigenous Environmental Network, the Berta Vive delegation brought a feminist contingent to make connections between what is happening in Standing Rock to the struggles of women in frontline communities around the world, and to contribute to actions and activities on the ground. Members participating on the delegation are: Linda Lee, Pam Tau Lee, Thuy Trang, Rachel Vernon, and Leon Sun from Chinese Progressive Association; Cerise Palmanteer from Asian Pacific Environmental Network; Candi Brings Plenty from Portland Jobs with Justice; and Helena Wong, National Organizer for Grassroots Global Justice Alliance and World March of Women US Chapter. Besides photos of my children and grandmothers this is the most cherished picture I have. It also capture one of my most valuable memories and lessons - laughter thru tears. These women along with a few others not in pic have shaped the woman I am today. The woman 2nd on the left is Nilak Butler and today would have been her birthday. These days when I am struggling with life's challenges I ask. (Pictured L to R: Gerry Warledo, Nilak Butler, Bineshi Albert, Casey Camp, Jackie Warledo and JoAnn Tall). Copied Julie Horinek, Faye Brown, Winona LaDuke, Jackie Warledo, David Tahchawwickah, Pamela Chiang, Lakota Harden and Pam Tau Lee. Those invited, on Facebook included Pam Tau Lee. Eric Mar October 21, 2016. Join us this weekend! from our '66 movements over 50 years to the present: Where do we go from here?http://www.bpp50th.com/conference-tickets-information/ Looking foward to seeing brother Richard Moore of Black Berets/SWOP/SNEEJ, Pam Tau Lee of Chinese Progressive Association/Red Guard/IWK, LA Brown Beret Founders Carlos Montes and Cruz Olmeida, my teachers from New College and the NLG Paul Harris & Stephen Bingham, Fallon Young Patriots, Young Lords, Indigenous leaders, youth, Danny Glover, Davey D, Ricky Vincent, Digital Underground, Emory Douglas, John Carlos, X-Clan and many others! In early October 2017, Chinese for Affirmative Action joined Chinese Progressive Association, Asian Americans Advancing Justice – Asian Law Caucus and notable community leaders Henry Der, Ling-chi Wang, and Helen Zia to form the End National Security Scapegoating (ENSS) coalition. The coalition was established in response to pervasive efforts by the U.S. Department of Justice that target and prosecute Chinese American individuals for espionage related crimes. One such Chinese American is Professor Xiaoxing Xi, who, in 2015, was falsely charged and prosecuted by the FBI for allegedly sharing technology to a Chinese-based company. He faced charges carrying a maximum penalty of 80 years in prison and a $1 million fine. After causing significant hardship and distress to Professor Xi and his family, the FBI eventually dropped the case without explanation or an apology. Members of the ENSS coalition and supporters at San Francisco State University. From left to right: Cynthia Choi, CAA Co-Executive Director; CA Assemblymember Phil Ting; Prof. Xiaoxing Xi; Grace Yoo, Chair of the Asian American Studies Dept. ; Dr. Russell Jeung, SFSU Professor; Pam Tau Lee, Chinese Progressive Association Board Chair. Today, Professor Xi is seeking justice and accountability for his wrongful prosecution and to help end national security scapegoating and racial profiling in general. In efforts to raise awareness and to mobilize the community, the ENSS coalition invited Professor Xi to participate in a speaking tour at San Francisco State University, University of California-Berkeley, and Stanford University. Along with other experts, Professor Xi spoke powerfully about the dangers of racial bias in government surveillance programs based on his own experience. Regrettably, this form of discrimination is part of our U.S. history. From the Chinese Exclusion Act to the internment of Japanese Americans during World War II, Asian Americans have been labeled and profiled as perpetual foreigners and threats to national security. The Muslim Ban, police violence against African Americans, and attacks against immigrants today must be understood in this same vein. CAA, with our ENSS coalition partners, will continue to oppose efforts to racially profile Asians Americans under the false pretext of national security, to advocate for greater government accountability, and to build alliances across affected communities. With Briana Ruiz, Jennifer Wylie Brass, Angela Berry-Philip, Isabella Zizi, Pennie Opal Plant, Patricia St. Onge, Pam Tau Lee and Corrina Gould. Pam Tau Lee supported Sandra Lee Fewer for San Francisco Supervisor. On April 6th, join BAYAN USA PNW, the US International Coalition for Human Rights in the Philippines (ICHRP) and MALAYA as Pam Tau Lee, Jill Mangaliman, and Michael Alcantara report back from an international solidarity mission last November 2017, where they learned first-hand about the growing fascism and intensification of human rights violations due to Duterte's all out war on the people. Learn why we should stand in solidarity against this Trump/U.S.-backed fascist regime and strengthen our international call against fascism. According to correspondent Eric Buerk, April 6 2018, a wide variety of socialist, anti-imperialist and Philippines solidarity groups convened in Seattle’s Southside Commons to hear firsthand reports from the Philippines, particularly in those areas that have been ravaged by the military under the cover of Philippine President Rodrigo Duterte’s criminal “war on drugs.” Convening groups included BAYAN USA PNW, the International Coalition for Human Rights in the Philippines (ICHRP) and MALAYA, with endorsers Party for Socialism and Liberation – PSL, Rainier Beach Key Club, Got Green, Town Hall Seattle, PUSO Seattle, Southside Commons, GABRIELA Seattle, Lionswire Communications, Climate Justice Alliance, 350 Seattle, Committee In Solidarity with the People of El Salvador (CISPES), Changelab, Anakbayan Seattle, Chinatown International Distict (CID) Coalition / Humbows Not Hotels, and Na’ah Illahee Fund. Michael Alcantara, current general secretary of Anakbayan Seattle, presented a startling report on the “Counter Insurgency” actions by the Philippines military which have been concentrated in Mindanao, and in particular in the city of Marawi. In response to the “occupation” of Marawi by Islamic fundamentalist fighters claiming affiliation with ISIS, the Duterte government undertook the wholesale siege of Marawi in 2017. When government forces declared victory after five months of indiscriminate destruction, hundreds of thousands had been displaced and virtually the entire city lay in ruins. Jill Mangaliman, an activist and member of GABRIELA Seattle reported on the way in which the Duterte regime has also used these counter-insurgency actions as a cover for overtly political repression. Pam Tau Lee, the chair of the newly formed US International Coalition for Human Rights in the Philippines (ICHRP-US) gave an enlightening presentation on the posturing on the part of Duterte. In early 2017, the carefully managed nationalist public image Duterte presented led some to believe that he might take an anti-imperialist stance in relation to the United States government under Trump. Yet, when the two met at the meeting of ASEAN in 2017 that illusion quickly melted away. Both leaders were seen to work hand-in-hand for the accomplishment of their mutual goals of exploitation in the Philippines, each praising the other for his leadership. All three speakers were unanimous in their call for the prevention of another fascist regime in the Philippines. They reminded us that we are engaged in one struggle with many fronts, and must stand together in order to face down the common enemies of the working class all over the world. Eric Mar April 10 2018. Always celebrating our movement victories and honoring our struggles! w/ ML Locedal Gordon Mar, Lisa Lee, Pam Tau Lee, Kathe Burick and Don Misumi and Gen Fujioka chatting in the back... — at San Francisco Board of Supervisors City Hall. This page was last modified on 9 April 2019, at 00:30.